FBKA also have an active closed facebook group. FBKA members Graham Read and Bill Dunstan joined community manager Carla Norton and development manager Alan Chitson from Aldershot’s Wellesley development to view FBKA’s newest members apiary at the Aldershot Browning barrack site. Following recent press articles there have been many reports of potential Asian hornet, (Vespa velutina) sightings across the UK. We would like to re-assure everybody that there have been no confirmed sightings of Asian hornets in the UK, and so far all hornet reportings received by the National Bee Unit have been identified as the native European hornet, Vespa crabro. Experts at the Centre for Ecology & Hydrology confirm that the hornet picture taken in Kent and featured in the press is not an Asian hornet – which would be darker in colouration, and that the size suggests European hornet. The Asian hornet or yellow-legged hornet, is smaller than our native hornet, with characteristic yellow legs, a dark velvety thorax, and a dark abdomen with a distinctive yellow band on the fourth segment. We are aware of the potential impacts they could have on honey bees and have contingency plans in place to remove them if they are identified. This includes comprehensive monitoring and teams ready to destroy any confirmed nests. For those who think they have seen an Asian hornet please first read the Asian hornet ID sheet which outlines the main differences between the native European hornet and this Asian hornet. Good to see the bees busy today, on a nice sunny and mild Easter Good Friday. Haven’t inspected my hives yet, but judging by the pollen being brought in and the fact the hives are still a fairly good weight would suggest that there’s healthy colonies in them all following the winter. 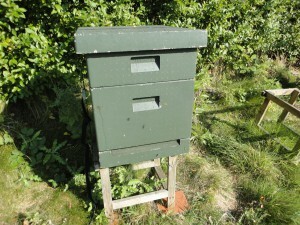 One way in which beekeepers can keep their bees healthy is to ensure that the colonies brood comb is changed regularly. Over a period of time the levels of pesticides, bacteria and other pathogens can build up within the comb to the point at which it can threaten the viability of the colony. Therefore it’s important to regularly change your brood comb at least every three years to keep your colonies clean and healthy. However, it’s difficult to remember the age of each individual brood comb frame over time and so a good idea is to mark one end of each frame with a blob of the same paint used to mark that years Queens. This is the current colour sequence that repeats every five years. 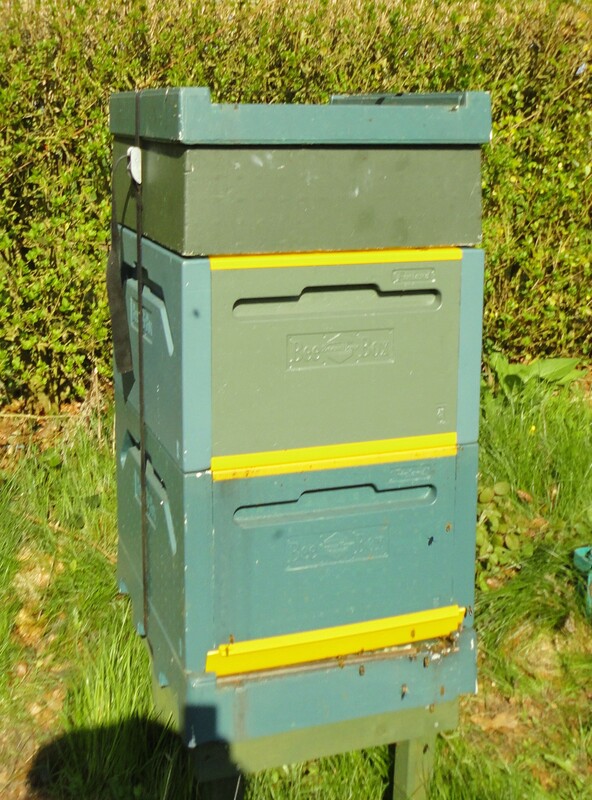 In the Fleet BKA training apiary, the hives are all new and therefore almost all the frames are marked with green blobs and probably won’t need changing until 2016/17 when they will taken out, sterilised and reused marked with the correct colour. Putting the colour on one end only also ensures that all the frames in the hive go back the right way round! Assuming that the colony is still relatively healthy, the best and least disruptive method of changing combs is a Bailey comb change. 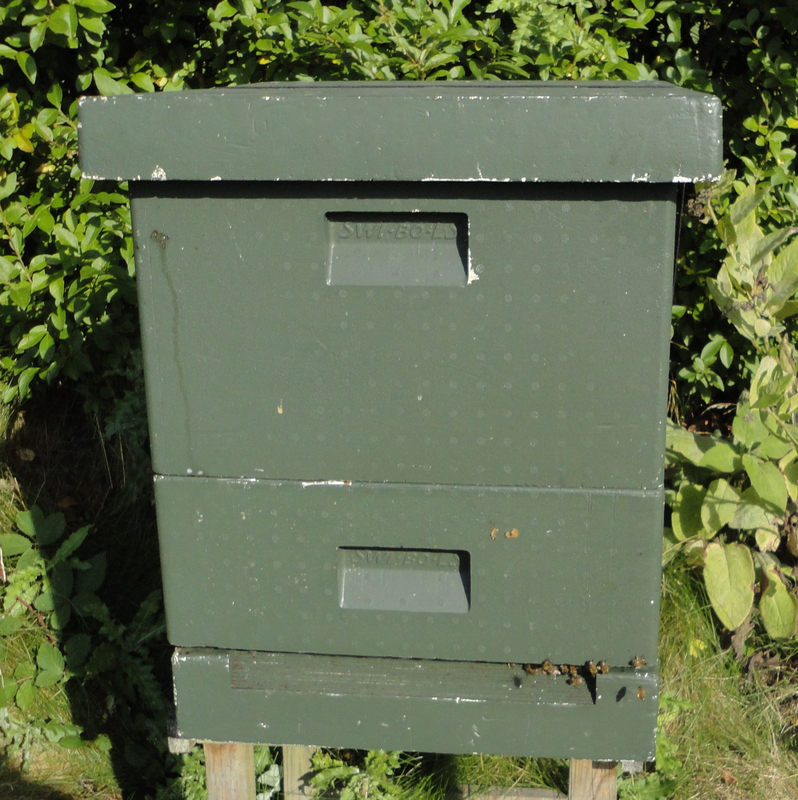 This simply requires an additional brood box of the same size as the original complete with a full suite of frames containing foundation and a feeder with sugar syrup. This process can only take place when the average day temperature is above 12-15C as the bees need to raise the temperature inside the hive high enough to enable wax to be manipulated by the bees. 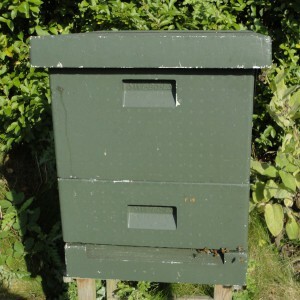 Assuming the weather is suitable, you simply lift off and remove the super and Queen excluder (shaking any bees back into the brood box) and place the new brood box with frames of foundation on top of the existing brood box. 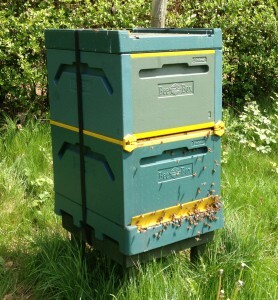 Unless there is a big inbound flow of nectar, its probably a very good idea to feed the bees with a sugar syrup solution so that they have a ready access of food from which they can generate the large quantities of wax needed to replace an entire brood box full of new comb. We typically use large top feeders holding up to 10l of syrup at a time placed on top of the new brood box. Stage 1 of a Bailey comb change. The new brood chamber is in place on top of the old one with a full feeder above. Leave the bees alone and after a few days you should start to see the sugar syrup levels fall within the feeder that lets you know that the bees are feeding and probably building comb. After about ten days or so have a quick peek in the top of the hive to see if the bees have started to create areas of fresh comb, probably on one or two frames to begin with. It’s highly likely that the Queen will soon come up into the new comb to start laying eggs in the fresh cells – A quick visual check will confirm this. Once the bees are building full-depth comb across more than one frame you need to ensure that the Queen is either already in the top brood box or move her there yourself and once this is done insert a Queen excluder between the top and bottom brood boxes. This will ensure the Queen stays up with the new comb and once she has started raising brood the nurse bees will transfer up to look after her and the new eggs that she is laying. 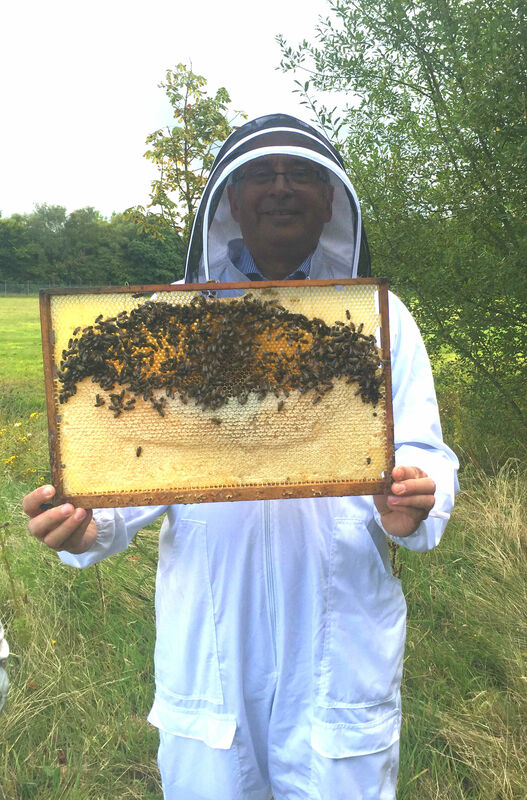 Bailey comb change stage 2 – The bees are now well established in the upper brood chamber and a second entrance has been opened. 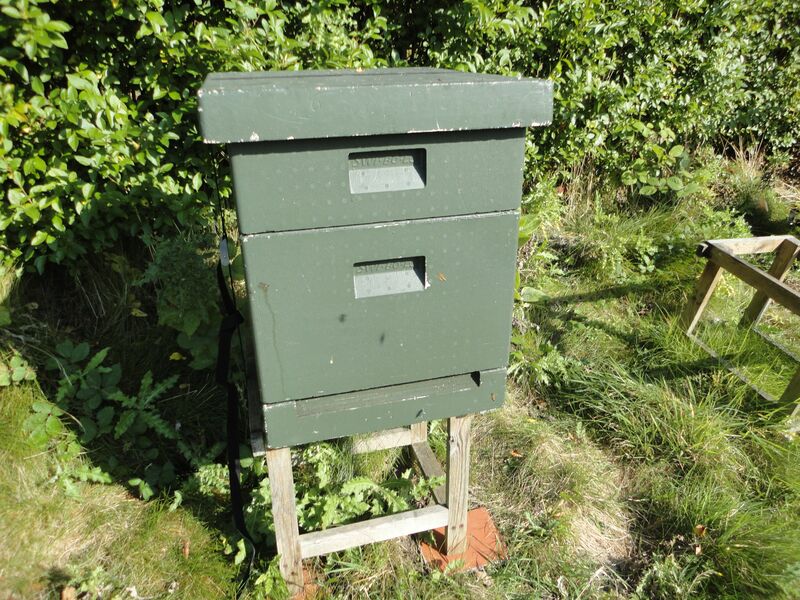 After three weeks or so all the larvae in the old brood box will have hatched and the bottom box can be taken away once any remaining bees have been shaken off the frames into the new brood chamber. The old combs will need to be disposed of and the frames and old brood box sterilised before they can be reused. 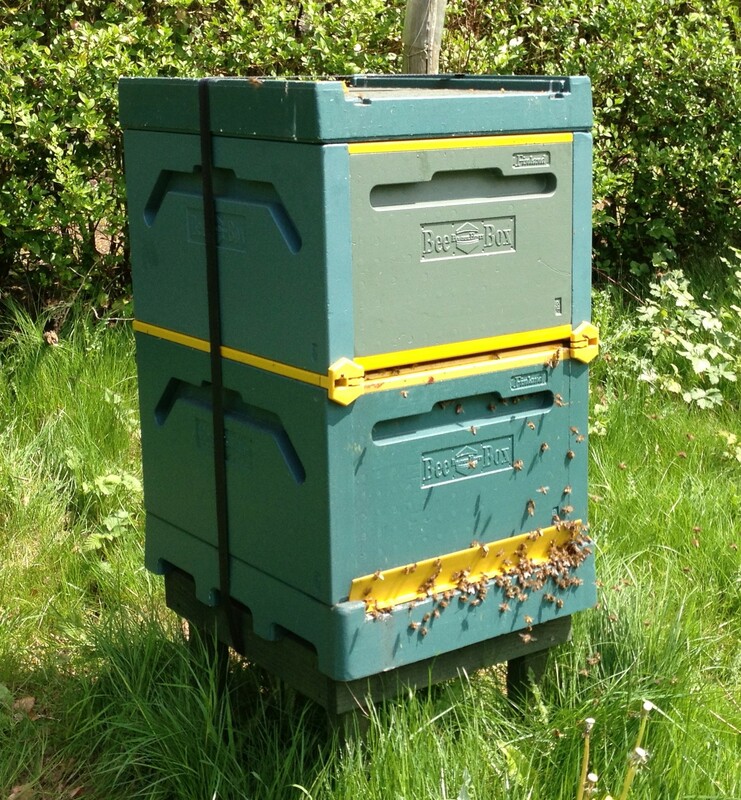 The Bailey comb change process really works well and whilst it can’t make a huge difference in the case of Varroa, it for almost all other pathogens and pesticide residue build-up, it ensures the colonies continued survival. It’s early spring and the sight of worker bees returning to the hive with full pollen baskets is a strong sign that the Queen inside has started to lay eggs in earnest for the start of the foraging season. During the winter, the bees tend to consume stores from the bottom and work their way up the combs through the hive until they become resident just under the roof, typically either close to or even in the super itself. It’s at this point that the Queen starts laying eggs again and if this happens to be in the super, your going to have a real job in your first spring inspection finding and moving the Queen below your re-inserted Queen excluder. This is made all the more difficult because early in the spring, the outside temperatures are marginal and you don’t want to chill the bees and especially the brood by exposing frames and manipulating bees in the open air for too long. For those of us with polystyrene hives, the high levels of insulation typically means the Queen starts laying earlier than she might in a wooden hive and therefore the potential of your Queen laying in the super is much more likely. So, on the one hand you want to inspect the hive early as possible to check on the bees, and keep the Queen out of the super, but on the other hand you don’t want to risk the health of the colony by chilling them… This is why “under supering” or flipping beehives in the previous Autumn is so useful. 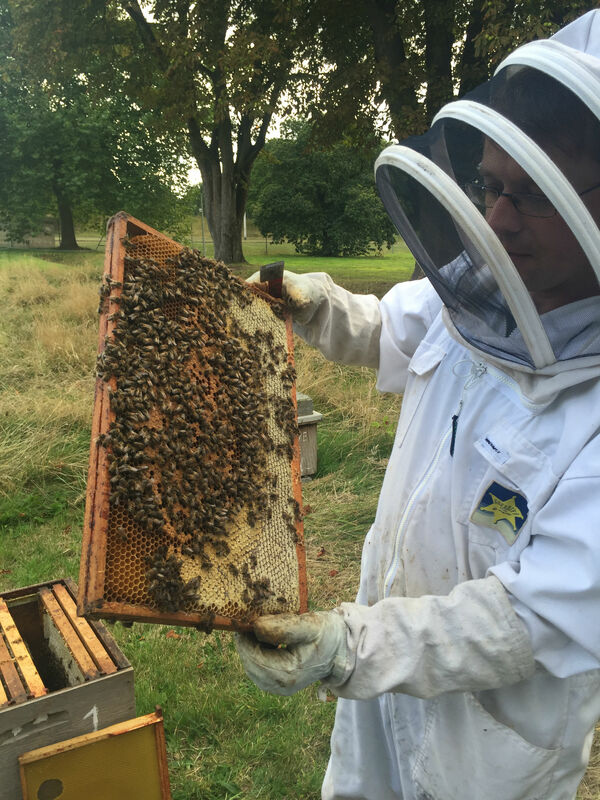 You can now put back any extracted supers that you want the bees to clean up briefly for a day or two and soon after apply any Varroa treatment directly onto the brood frames without having to remove and replace the full super, saving your back and minimising disturbance to the bees. 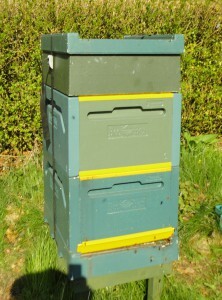 The hive can now stay in this configuration right through until next April. Any Oxalic acid treatment will be channeled directly between the brood frames and get to the bees much more effectively and you can also apply thin patties of sugar candy on top of the brood frames under the roof as shown here. Part-eaten pack of sugar candy placed under the roof on top of the brood frames. These are hungry bees! 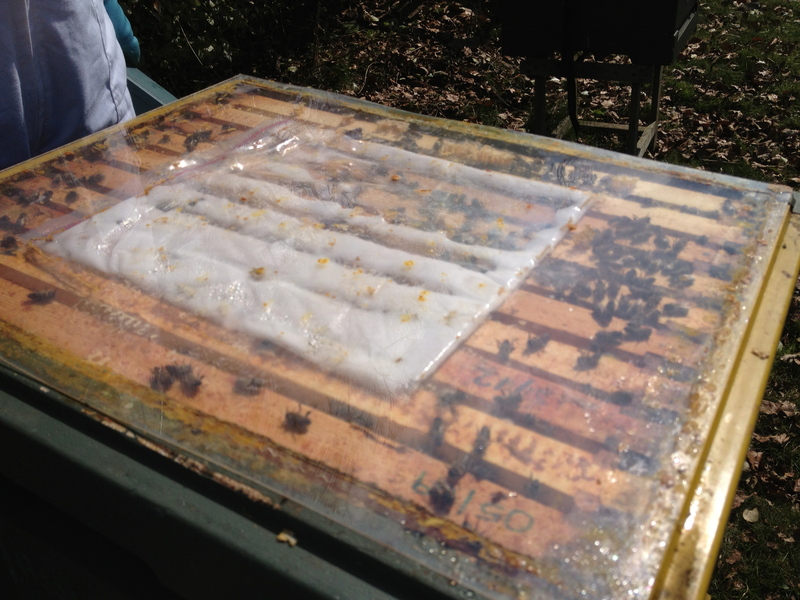 The clear plastic cover allows us to see how the bees are doing down in the combs without opening the hive unnecessarily and if the bees do start eating through the candy, then you can quickly replace the patties as required. 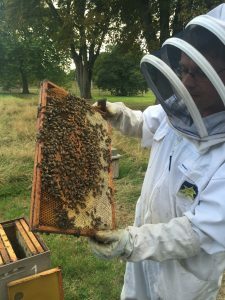 We can now relax through early spring knowing that if the Queen starts laying early in the year it will be close to the top of the hive – in the brood box. We can therefore delay our full spring inspection until it really is warm enough to go (3 or 4 days at 15C plus) through the hive inspecting the brood frames up close for any sign of disease or other problems. During this inspection we can take off the brood and super, clean or replace the floor and then place the brood box back in place followed by the queen excluder and then the super on top ready for the main nectar flows in April, May and June, adding further supers as required. Hive in “Summer mode” with one or more supers above the brood box. Note the thick tiles ensuring the hive stays stable. This process minimises any major disturbance to the colony, especially in early spring and in late summer/autumn and ensures that the Queen stays where you want her.